Good nutrition goes beyond eating foods that are fresh and wholesome. If the process of digestion is sluggish, your body creates sticky food residue called Ama that can clog the channels in the body and hinder the process of assimilation. Proper digestion and metabolism, on the other hand, results in the conversion of the foods you eat into healthy body tissues. 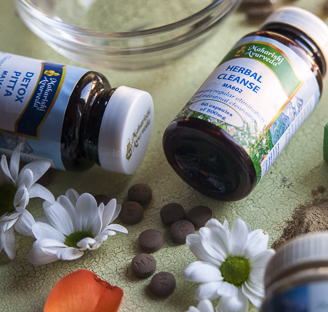 Herbal Digest is a blend of 13 ayurvedic herbs and spices that supports assimilation and elimination, so you won’t feel dull and heavy after meals. The herbs in Herbal Digest are combined in precise proportions and prepared in the traditional Ayurvedic way. This improves the bioavailability of vital nutrients. It also creates synergy -- the collective benefit is much greater than that of isolated, individual herbs. Pomegranate Seeds help balance and stimulate both the appetite and the process of digestion. The seeds are processed in the unique and specific way described in traditional texts. This maximizes the potency. 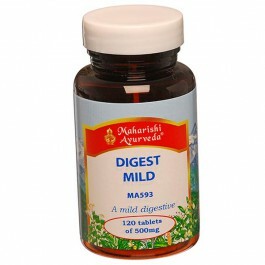 The ingredients in Herbal Digest include the Six Ayurvedic Tastes: sweet, sour, salty, pungent, bitter and astringent. Each taste stimulates a different aspect of digestion and metabolism. Chewing food stimulates enzymes which prepare the digestive tract for action. Then the digestive fire (Jatharagni) is controlled by three factors: Pachaka Pitta that breaks down the food; Samana Vata that moves and stirs the food separating nutrients from waste; Kledaka Kapha that moistens and lubricates. 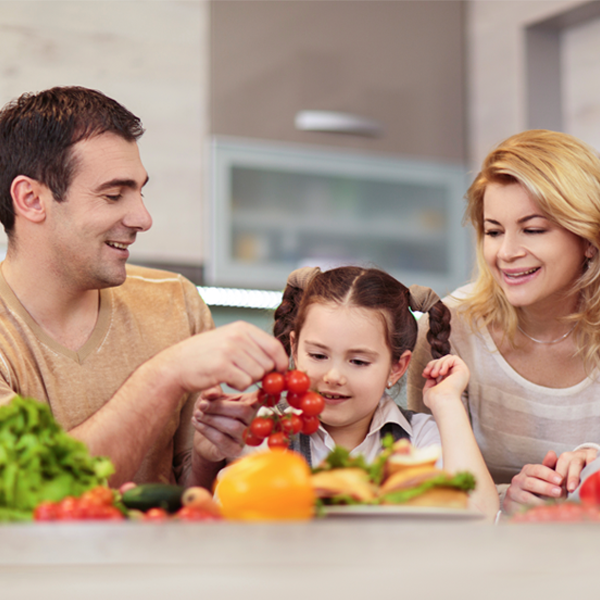 Eat at regular times; eat in a settled atmosphere and attend to the food while eating. All food is essentially a source of order and intelligence and Maharishi AyurVeda preparations particularly harness the intelligence of plants to increase the orderly functioning of mind and body. To maximise the intelligence of the plants they are harvested at their best, processed with great care and skillfully combined in time-tested ways. How they are used is also important. When you buy products from Maharishi AyurVeda Products UK, you can be assured of the products’ quality and safety. Most of our herbal formulations are made in Maharishi AyurVeda Products Pvt Ltd.'s export factory in India which holds the AYUSH Premium Mark, ISO2200, ISO-IEC 17025, and WHO-GM quality certifications. 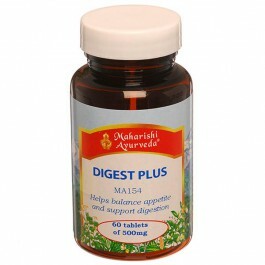 Helps the whole digestive system - Balance your appetite and improve your digestion. Proper digestion and metabolism convert foods into healthy tissues, abundant energy and blissful senses. If the process of digestion is sluggish, your body creates Ama, the fertile ground for disease. Herbal Digest supports all five bhutagnis, regular appetite and freedom from cravings, making you feel more light and comfortable. Pomegranate Seeds help balance and stimulate both the appetite and the process of digestion. The seeds are processed in the unique and specific way described in traditional texts. This maximizes the potency. These special herbal preparations are carefully formulated by Ayurvedic experts according to the original traditional texts. 60 tablets - 30g, 30-15 days supply. To support appetite take 1-2 tablets twice daily 10 minutes before main meals with a little warm water or warm milk. To support digestion and maintain balanced gas production take 1-2 tablets 15 minutes after meals preferably with a little salted lassi. (Lassi = one part fresh yoghurt blended with 2 parts water with a small pinch of salt. Each tablet contains 25 mg of salt.